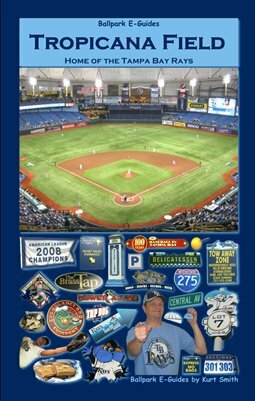 If you’re visiting Tropicana Field for the first time, there are a few things you should probably know. The Trop is one of the more wallet-friendly venues in baseball and won’t break your bank, but that doesn’t mean there aren’t a few ways to save on a trip to the game. Visiting Tropicana Field, Tip #1: Check the secondary market. The Rays are the lowest drawing team in baseball, so with the exception of a few high demand games like Opening Day and weekend Yankees games, you can almost always score a great deal on secondary outlets like SeatGeek. If all you care about is getting in, though, you can buy the cheaper seats at the box office. You can spread out a bit here. Visiting Tropicana Field, Tip #2: Buy the cheap seats. 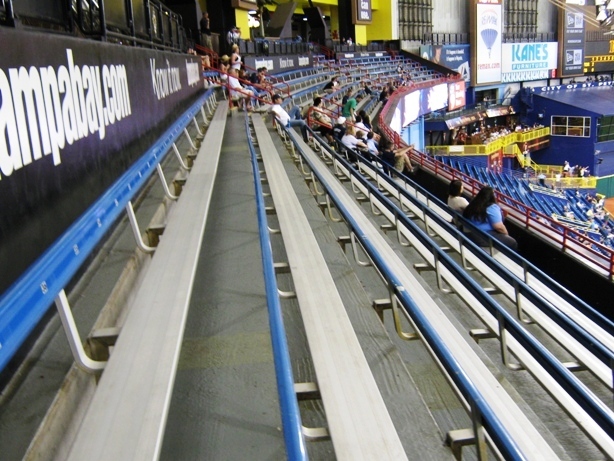 As stated, the Rays don’t draw big crowds, so you can almost always move to a better seat if you don’t get greedy. The upper level especially is almost universally the same price for seats, so no one is likely to care if you move a few rows down and closer to home. In the lower levels the ushers are more likely to give you a hard time, but you could probably find a decent place to sit. Visiting Tropicana Field, Tip #3: Carpool to the game. 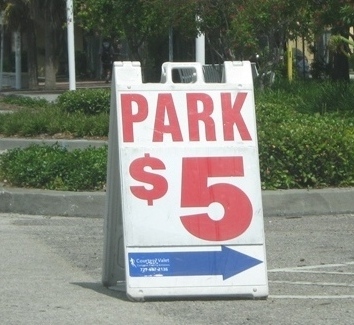 The Rays offer free parking to cars with four or more people riding in them; it’s offered to the first 100 cars for Sunday games and most every car for other games. When was the last time you parked for free in a team’s parking lot? On top of that, tailgating is allowed in most lots, so you can have your buddies bring some grub since you took care of the parking. 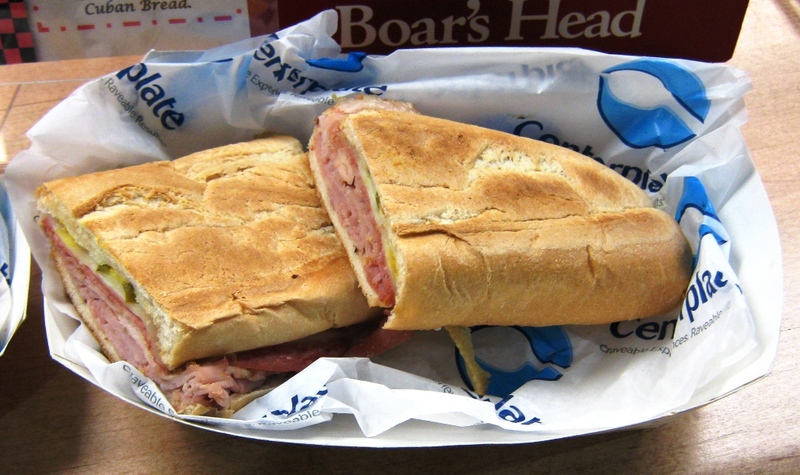 Visiting Tropicana Field, Tip #4: Try the Mac Bat or a Cuban sandwich. The Mac Bat is probably something you’ve never seen before; it’s a breaded cone shaped like a baseball bat (obviously) full of mac and cheese, which is then topped with chili, layers of bacon and jalapenos. Yes sir. But there’s also the classic Cuban sandwich, which is as good a go-to items here as any…ham and gooey Swiss cheese on pressed bread. There are other cool food stuffs too, but the Mac Bat and Cuban are best for first time visitors. And when Ferg talks, people listen. Visiting Tropicana Field, Tip #5: Post-game at Ferg’s. Ferg’s is more or less the only tavern within walking distance of the Trop…it’s right across the street in fact, and you can park there fairly cheaply if you don’t have enough folks in your car for free parking. Ferg’s has decent wings and other food, inexpensive drinks (at least compared to inside the Trop), and it’s an indoor/outdoor bar with a great atmosphere. 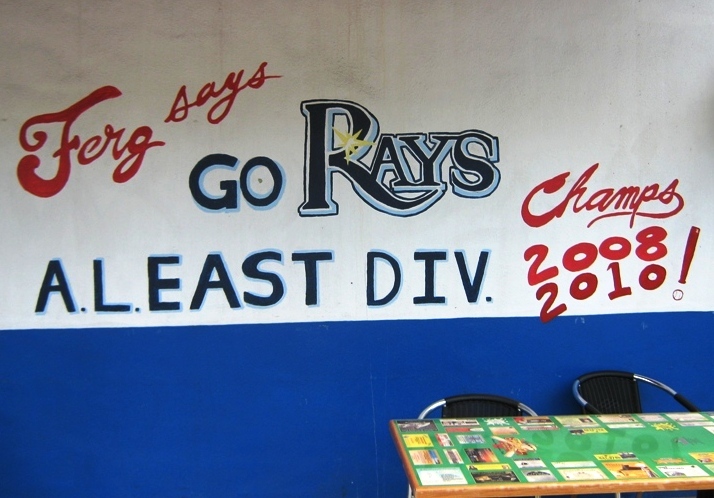 Most Rays fans always make Ferg’s part of the game day experience. There you go; five things to know about the Trop. 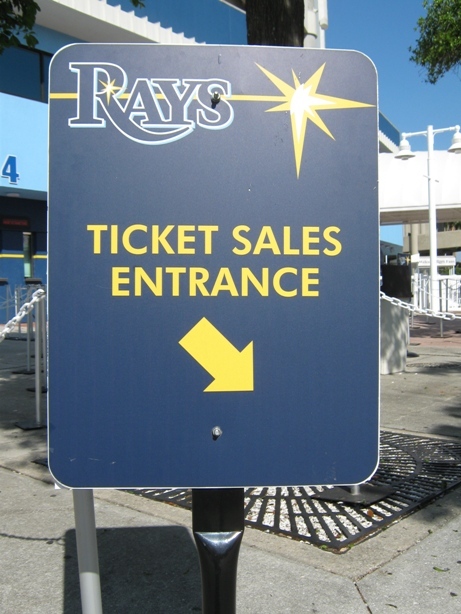 The Rays are happy to get people into the ballpark, so they offer lots of deals on tickets and parking. All you need to worry about is what you’re spending your food dollar on. 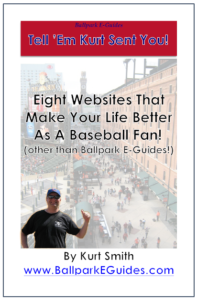 Speaking of maximizing your entertainment dollar at the Trop, you’d do well to read one of these before you go.